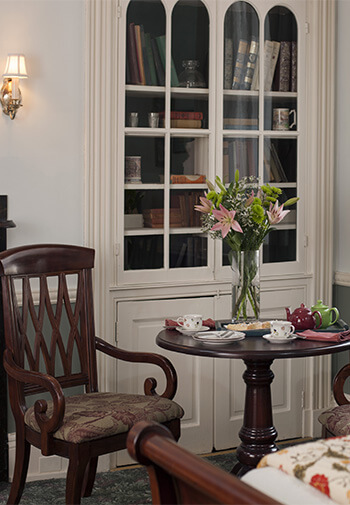 Reserve the stunning English Library Suite at Carlisle House Bed and Breakfast for your next visit to the Harrisburg, PA area. Featuring a queen-size bed, private bathroom, and an in-room double whirlpool bath with shower, this suite located in Downtown Carlisle offers convenience without lacking in luxury. Rates for this room vary from $169 to $239 according to the season. 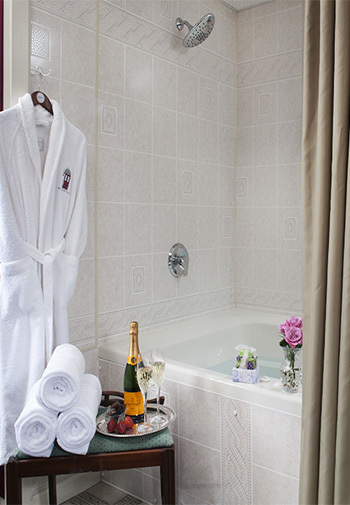 If you prefer not to book online, please call us at 717-249-0350 or email us at Info@TheCarlisleHouse.com. Originally the 1st-floor middle parlor, the room features beautiful encased bookshelves to either side of the ornamental marbleized slate fireplace and a queen sleigh bed. A separate half bath with double vanity is en-suite and an in-room double whirlpool with twin showers can be enjoyed under chandelier light from the 11-foot ceiling. At the work table, there is both Ethernet and wireless Internet connection, and of course a power strip to recharge your smart devices.